In April 2000, a few months after Steve Ballmer succeeded Bill Gates as CEO of Microsoft Corp., I met him for dinner in a Seattle suburb. That morning, the New York Times had run a Page 1 article describing the various major business units at Microsoft—operating systems, applications, etc.—and how each of them might fare as a separate company. This was no abstract exercise at the time; a federal judge, having ruled that Microsoft had systematically violated America’s pro-competition law, was considering whether to order the company broken up. As I related in my newspaper column at the time, I semi-jokingly asked Ballmer which of the companies he’d like to run. “I won’t even look at that!” he semi-shouted, drawing bemused looks from other diners, and flung the paper to the floor to emphasize the point. After picking it up, he spent most of dinner explaining why a breakup was an absolutely terrible idea, not just for Microsoft but, in effect, for humanity. Someday, he promised, I’d realize he was right. That day hasn’t arrived yet. 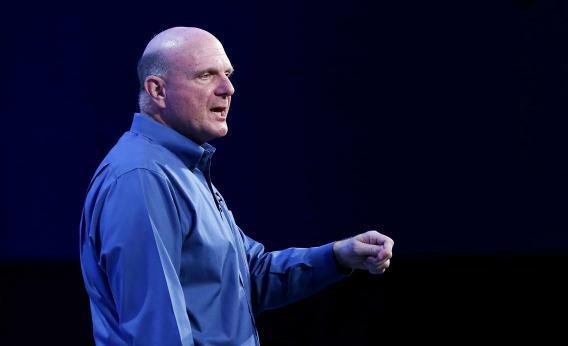 As Ballmer’s era as CEO comes to close—Microsoft says he’ll step down in the next year—I find myself wondering what would have happened if Microsoft had settled the case after Judge Thomas Penfield Jackson indeed ordered the breakup that June. Jackson’s order would have split Microsoft in two: operating systems and applications. That wouldn’t have been enough, most likely, for the kind of agility needed in a world where the Internet has disrupted so much, where Microsoft reacted late to its importance and even now has been slow. Yet the biggest innovations in recent years have come from smaller teams, often tiny ones. Multiple perspectives are a given in a hyper-connected world. And while patience is plainly a virtue, a key notion of innovation today is that we launch things before they are fully baked. Then we iterate and fix, and over time we end up with better—but never perfect—products and services. In rare cases, innovation comes from a flash of genius. In most cases it’s the result of a process. Microsoft understands this now, and Ballmer has been a much better CEO over the past decade than his worst critics claim, especially given the constraints of the behemoth organization he has been running. But the company has labored under a handicap beyond the normal inertia of giant enterprises and Microsoft’s unwillingness to tamper too much with its biggest cash cows. Its settlement with the Bush administration looked like (and was, for the most part) a cave-in by the government, but it had one widely unappreciated effect: Microsoft spent a decade under a consent decree that slowed it down in a tech world that was moving and evolving faster than ever. We can only speculate about what might have been had Microsoft broken itself up into three or four companies focusing on different parts of the tech/communications ecosystems. Perhaps they’d have ended up trying to reassemble the monopoly, as the once-“Baby” Bells have done with telecom service. But each of these new enterprises would have started life with enormous advantages, particularly ample capital and, at least for the operating systems and Office businesses, the kind of dominance that would spin off ample future cash for reinvention. Perhaps the spinoffs would have missed the boat just as badly on mobile—Microsoft was actually early in mobile but never turned some good ideas into a compelling experience, leaving the field open to Apple and others. Maybe none of spinoffs would have had the idea or backing to launch the Xbox, which burned huge amounts of money early on but has become a major business in its own right. We can’t know these things. But we can be sure of this: The spinoffs would have been more nimble and innovative, and our tech and communications ecosystems would have evolved in different ways. My guess is that evolution would have been better for all of us, including the shareholders whose stock has gone nowhere for a decade or more. Five years later, Ozzie, one considered a possible Ballmer successor, was out. His ideas, and his style, had turned out not to fit. I thought he could have been a fine CEO, with the requisite vision—and just as important, an awareness of what he doesn’t know—to move Microsoft forward in these deeply uncertain times, provided he find a strong chief operating officer to handle the purely administrative part of the job. As Microsoft looks for a new leader, it should put Ozzie on the list.